FAMED FOR ITS BOLD ARCHITECTURE & SKYLINE PUNCTUATED BY SKYSCRAPERS, CHICAGO IS A WHOLLY UNIQUE CITY. On this tour experience a two hour land tour and then enjoy the views from the water as you cruise along in a gorgeous streamliner yacht! Highlights include the business district, Grant Park, lake Point Towers and exclusive shopping areas. See all of Chicago's top attractions with the Big Bus Classic Package. Hop on hop off at your leisure at 14 conveniently located stops. Tour through Grant Park & Millennium Park, travel over Michigan Avenue Bridge and over the Chicago River to continue on the famous Magnificent Mile. Chicago's most thrilling boat ride! Seadog Speedboat Lake Tour is the best way to view Chicago from the lake combining an exciting ride with fantastic views of one of the worlds most famous city skylines. ​A three hour guided walking tour that lets you sample Chicago style deep-dish pizza, traditional Chicago hot dogs, beer and original recipe brownies! Visit some of Chicago's most beautiful rooms such as Macy's Walnut Room and the Palmer House Lobby. Price includes all samples. 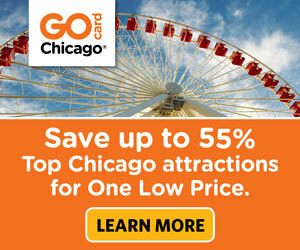 Admission to three of Chicago's 25 fun attractions! Choose from top museums, sightseeing city and lake tours (such as the Hop on Hop off bus) PLUS get discounts on dining and shopping. Pass can be used for up to 30 days. This pass is valid for 5 attractions and can be used for 30 days. You can use it towards a Hop on Hop off bus tour, Shoreline Sightseeing River Cruise, Lake Cruise and attractions that include the Willis Tower, Legoland, Brookfield Zoo, Art Institute of Chicago and many more!